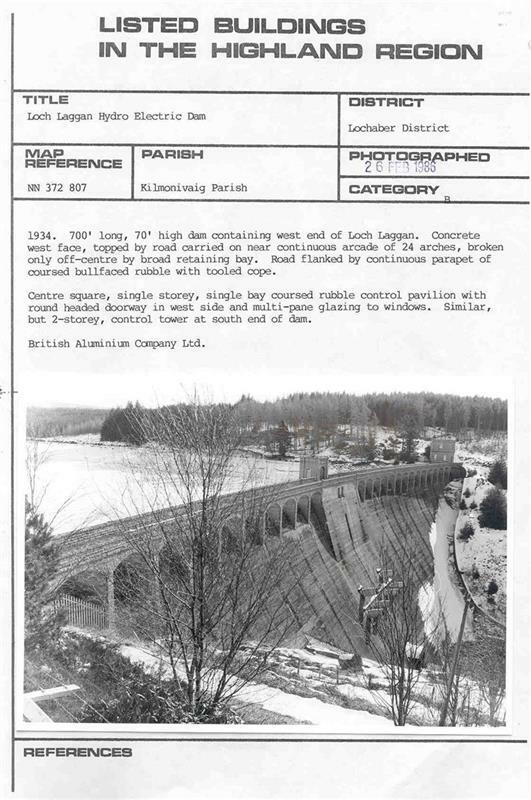 A curved plan gravity dam in a very prominent location adjacent to the A86, forming part of the Lochaber water power scheme and aluminium smelter, one of the most significant engineering schemes of the 20th century in Britain. <1> Historic Scotland, 14/11/2011, Combined Statutory and Descriptive List of Buildings of Special Architectural or Historic Interest (Highland Council, One Hundred and Twenty Ninth Amendment) 2011 (Text/Designation Notification/List of Buildings). SHG25577. <2> Lochaber Archaeological Society, 2012, War Years Over Lochaber (Text/Publication/Leaflet). SHG25652. <1> Text/Designation Notification/List of Buildings: Historic Scotland. 14/11/2011. Combined Statutory and Descriptive List of Buildings of Special Architectural or Historic Interest (Highland Council, One Hundred and Twenty Ninth Amendment) 2011. <2> Text/Publication/Leaflet: Lochaber Archaeological Society. 2012. War Years Over Lochaber. Digital (scanned as PDF).